The 75cm diameter on this black anti-burst gym ball will be ideal for fitness enthusiasts who are over 178cm (5'10") tall. Whatever your fitness goals are, adding exercises on this Swiss ball will spur you on and help you towards you aims. Improve your balance, flexibility, strength and toning and perform pretty much limitless amounts of drills on this highly practical fitness accessory. Also, you can use weights such as dumbbells or kettlebells to enhance the resistance and efficiency and to increase your muscle toning and strength. Tested to rigorous standards with a high 200kg (31 stone) anti-burst rating, you can work out using this tool with full confidence, and the ribbed design makes sure that there is a high level on grip on floor surfaces. 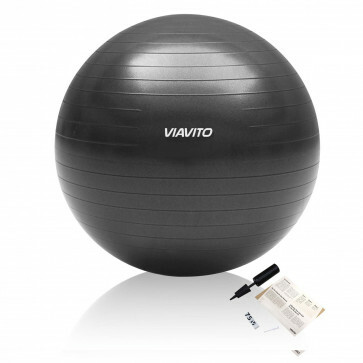 Included with the gym ball is a hand pump and the inflation instructions so you can set it up perfectly.